The Eastern Partnership (EaP) represents the most ambitious project launched by the European Union in order to support political and socio-economic reform in its neighbourhood, with a view to stepping up political association and economic integration. Notwithstanding the achievements of the framework, the EaP requires re-conceptualization focusing on those issues where cooperation and convergence are not only feasible but also more suitable in view of pan-European economic growth and security. 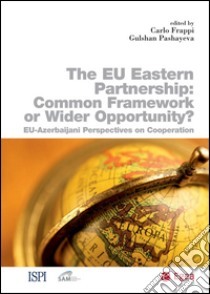 Moving from the relations between the EU and Azerbaijan, which is gradually but steadily emerging as a key interlocutor for EU Eastward projection, the aim of the volume is to assess the functioning of the EaP bilateral and multilateral track along selected policies, in order to identify means to improve the overall efficacy of the framework, taking into consideration both EU and Eastern partnersO expectations and needs. Providing fresh analysis on the EaP development, the volume Ð the result of an ISPI-SAM joint research project Ð brings together and compares perspectives and expertise from the EU and the neighbourhood, fostering dialogue and mutual comprehension on issues of common concern.